Apprentice Hanafi Noorman does not get many opportunities. When he made his debut last year, he managed to score once in 15 rides. But the young lad was still winless this year after 43 rides, although he found one to beat three times, until this afternoon. 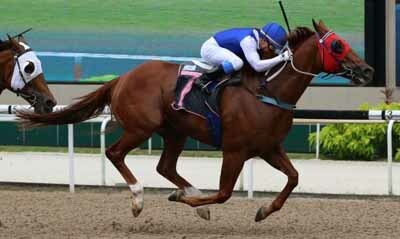 Young Keah Yong recently took over SHAQRAA and the gelding was having his third start for the trainer. Hanafi rode him for the first time last start and they managed to beat one home after being in the rear bunch throughout. But was it was a much improved SHAQRAA who lined up in the Class 4, Premier - 1100m sprint on the polytrack this afternoon. With Hanafi in the saddle again for his only ride of the afternoon, the six-year-old was always well up with the pace and won comfortably by one length. "I did my homework and I saw that this horse won by travelling on the outside before. I was not worried he was three deep today," said Hanafi. "He also jumped better this time, and was always on the bit, and I think the blinkers also helped him. It’s nice to get my first win for the year." It was the third win in 17 starts for SHAQRAA.